We had the official opening of our 12 x 12 exhibition last night and it was great to see such a variety of mini quilts on display. I made a modern interpretation on a whole cloth quilt by hand quilting and embellishing one piece of Kaffe Fassett fabric. I used some of my embroidery threads and some beads to add bling because the theme was Bedazzle. 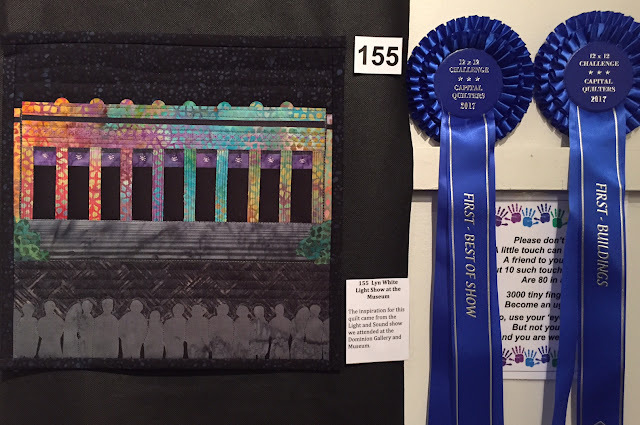 I won a Highly Commended ribbon for this quilt and I was thrilled. There was one winner and one highly commended in each category, so I was very happy. I used my favourite wool felt applique technique to make a bouquet of flowers. I bought some special Frida Kahlo fabric at Bolt of Cloth in Auckland and decided to use it in this mini quilt. I fussy cut some images of Frida and then worked around them to build it out to 12" square. This quilt includes machine and hand quilting. Most of us had been keeping our quilts secret, so it was lovely to see them all revealed and be able to match the quilt with the maker. The Best of Show award went to Lyn White for her amazing mini called "Light Show at the Museum". Congratulations Lyn. Here's all the details of the exhibition. Best news is it's FREE, so if you live in Wellington I recommend you make plans to visit either this weekend or next. So much fun! Thanks for sharing the inspiration. such a variety of ideas! Congratulations on your ribbon! Congratulations...love the vibrancy of your entries. Wish I was able to see them in person. I like them all but especially like Flora and Fauna. Seeing it hanging on the wall it looks like a different quilt. Lovely work on all three. Your group is very talented. Well done on winning a ribbon, exciting! I admire your sense of color and creativity. Congratulations on your ribbons. Great quilts with some lovely ideas and designs! Love the best in show. Creative use of that Kaffe fabric! Congratulations on a ribbon! I had a chat with Bridget Macfarlane about the exhibition on my podcast, sounds like a huge success for your guild. And I've been enjoying seeing all the photos on instagram and blogs. Congratulations Wendy!!! I love all three of your entries!! The whole cloth Kaffe quilt is brilliant! I love the idea of taking a fabulous piece of fabric and making it more fabulous. I finally picked up my felt again on the weekend. It was so neglected. You have given me a few more stitch ideas. I've been waiting for this! So fun to see your 12x12s all together with their colleagues, and a huge congratulations on your commended award. I'm happy you received recognition--all your quilts are terrific, but you have to know that the flowers of felt quilt is my favorite.